T-mobile Offers Color Blackberry in the US | BlackBerry Blast! We've all heard about the color Blackberry and it's not officially being offered in the U.S. T-Mobile is now offering the first BlackBerry wireless handheld with a color screen. Research In Motion announced the new BlackBerry 7230 in June and it has been available in parts of Europe and the UK since it was first announced. 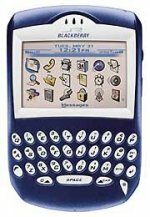 The Blackberry 7230 has 16 MB flash memory plus 2 MB SRAM, a rechargeable and swappable lithium battery, and USB connectivity. Both the screen and keyboard are backlit. T-Mobile is offering the device for $399. We'll have to see if RIM's recent legal troubles affect the sales of the 7230. RIM is involved in a bitter patent-infringement lawsuit, and last week a judge issued an injunction that blocks RIM from selling the Blackberry in the U.S. The judge also ruled however, that the injunction be stayed until after RIM has had a chance to appeal the decision.